On Thursday August 11, 5 p.m.– 8 p.m. there's an opportunity to sample gourmet food and wine at nine locations in downtown Walnut Creek. The event benefits the Diablo Ballet and its acclaimed PEEK Youth Outreach Program. The PEEK Youth Outreach Program brings arts education to 5,000 under-served elementary school children each year in Contra Costa County. With arts education so underfunded, it's a wonderful opportunity to help the ballet reach out to these kids and introduce them to the joys of arts and ballet. You are also invited to an exclusive Gallop wine tasting at Residual Sugar Wine Bar. Rain or shine, participants will stroll around town at their convenience tasting the gourmet delights from these top restaurants. The dancers from Diablo Ballet will be galloping the streets with you all night long. Tickets are $40. Groups of 10 or more can receive a special group ticket offer. To purchase tickets, call 925.943.1775 or visit the Diablo Ballet Web site Gourmet Gallop page. Congressman John Garamendi recently issued a commendation for the PEEK Program for its continued commitment to serving the youth of our community. I just posted an article over on San Jose Fitness about the 2011 Walk for Farm Animals. This is a great cause, an opportunity for those who want to stop animal abuse and help farm animals and who are concerned with the cruel and horrific practices of factory farming to take a stand in support of compassion for all! This year the fund raising goal for the 35 walks that take place across the U.S. and Canada is $1 million. The Walks raise vital funds for Farm Sanctuary’s life-saving work and bring together thousands of people to promote kindness towards animals. When you walk, you give hope to billions of farm animals who are suffering right now on factory farms. The Walk for Farm Animals is a positive way to speak out on behalf of animals who cannot speak for themselves and to make a real difference in their lives. If you're unfamiliar with the group, a book featuring the loveable faces and captivating stories of some of the rescued animals who reside at the bi-coastal shelters of Farm Sanctuary (www.farmsanctuary.org) won the Gold Medal in the Animals/Pets category of the Independent Publishers Awards (referred to in the publishing industry as the “IPPY Awards”). Ninety-Five: Meeting America’s Farmed Animals in Stories and Photographs. Check it out! A press release today by Consumer Reports Health provided information about the widespread use of alternative treatments, used now by three out of four adults. (See information about the study in the post: 3 out of 4 adults use some sort of alternative therapy). Acupuncture and acupressure. Contact the American Academy of Medical Acupuncture (www.medicalacupuncture.org) or the National Certification Commission for Acupuncture and Oriental Medicine (www.nccaom.org). Chiropractic. Contact the American Chiropractic Association (www.acatoday.org). Massage. Contact the American Massage Therapy Association (www.amtamassage.org) or the National Certification Board for Therapeutic Massage & Bodywork (www.ncbtmb.org). Meditation. For stress-management programs, check local hospitals and nearby medical schools. Or teach yourself with a book or audiotape. The Meditation Society of America posts free instructional information at www.meditationsociety.com. Yoga. Contact your local yoga studio or fitness center. Information about yoga therapists can be found at the International Association of Yoga Therapists at www.iayt.org. A new reader survey published in the September, 2011 issue of Consumer Reports says three of four adults use some form of alternative therapy for general health. No surprise, really, but interesting I think, yes? Readers rated prescription drugs as helping the most for the majority of 12 health problems, but chiropractic, deep-tissue massage, and yoga, dominated the lists of helpful alternative treatments for discomfort from conditions such as back pain, neck pain, and osteoarthritis. The survey also suggests that meditation, deep-breathing exercises, and yoga, are being used to treat a range of conditions including anxiety, headache and migraine, depression, and insomnia. Meditation and yoga proved equally effective for treating anxiety (42 percent and 46 percent respectively said these therapies "helped a lot") and depression (36 percent and 35 percent respectively). Yoga did about as well as meditation for insomnia (21 percent and 24 percent) but it significantly outperformed meditation for headaches and migraine and especially for back pain. For back pain, yoga, deep-tissue massage and Pilates all rated about the same as prescription medication. Chiropractic therapy outperformed all other treatments. Meditation was helpful to almost a third (29%) of those few who tried it (5 percent). For respiratory problems such as cold & flu and allergies, the survey found that very small numbers of readers tried deep-breathing exercises or chiropractic care. Those who did, however, reported promising results. Although only 2 percent of cold, flu or allergy sufferers sought chiropractic care, more than 40 percent said it helped a lot. Similarly, 3 percent tried deep-breathing for allergies and 32 percent said it helped a lot. Three percent also tried deep-breathing for cold & flu and 35 percent said it helped a lot. The report includes a brief user's guide for hands-on and mind-body therapy with an assessment of the evidence. People who decide to try alternative treatments should talk to their physician first to set realistic expectations for improvement. Many insurers cover acupuncture and chiropractic, and some offer discounts for other treatments. In addition, some treatments might qualify for reimbursement from a consumer's flexible spending or health savings account. Consumers should check with their plans for details. The in-box is an amazing assortment of information. I used to love getting my daily mail in the mail box, but I gave up mail about 15 years ago and never looked back. Now I love opening my in-box of email (well, for the most part). I had to do some gyrations to tie together the Census Bureau's promotion of National Junk Food Day with the study from the Daily Beast that San Jose residents live longer than other people in the US -- AND tie those two facts together with the FDA's first ever National Wellness Week. I can't say whether I did a great job of making sense of why I published those three tidbits together. But the truth is, I did it because I thought they were funny tidbits, showing how much "stuff" comes at us every day. FWIW, head on over to the Examiner column and see if you think I succeeded or if I should have been more wickedly funny. I'm a fan of the Williams sisters - Venus and Serena that is -- for a number of reasons that pretty much center on on the same reasons that most people like celebrities: they seem like people who have a good mix of raw talent and exceptionally hard work, people who really love what they do. 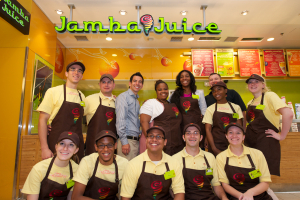 So I was interested to see that Silicon Valley-based Jamba Juice signed Venus Williams as celebrity spokesperson and as a Jamba Juice franchise store owner and has plans to open five stores in the Washington D.C. Metro Area over the next two years. It's a very high-profile endorsement for the chain. Williams was in Bethesda, Maryland on July 6 to celebrate the opening of her first Venus Williams-Jamba Juice store, in the Westfield Montgomery mall. She expects to open a second store in the Washington D.C./Maryland market before the close of 2011. In her role as Company spokesperson, Williams will represent Jamba Juice, one of her favorite health and wellness brands, in key advertising and marketing campaigns, through personal appearances and in digital and social media activities.